As the president of Reputation Partners, LLC, a corporate communications firm with years of experience in commercial real estate, I’ve worked with building owners and managers in Chicago and nationally. I also bring a perspective as a tenant and prospective tenant, since our firm has had offices in three Chicago buildings since we were founded in 2002. One thing that has puzzled me throughout our tenancy and prospective tenancy (ranging from Class B to Class A buildings) is this: Building owners and managers often lack a communications strategy to retain existing tenants or attract new ones. I fully understand and appreciate the value of commercial real estate brokers. However, I think building owners should consider supplementing the work of brokers to make sure long-term tenant attraction and retention goals are met. In talking to building owners and managers, I’ve learned many are reluctant to engage tenants on any proactive matter (unless it’s something like fire or other safety issues) for fear of “stirring things up.” Even with Chicago absorption returning to pre-recession levels, I think this is a mistake. Tenants want to hear from building owners/managers. What are you doing to address any obvious or not-so-obvious problems or issues? What are you doing to make sure the building is safe? Green? What kinds of amenities are you offering or trying to provide? What’s happening around the building (construction, new amenities, etc.) that tenants – and their employees – would want to know about? And, most importantly, why should we stay in this building when our lease is up? Smart property managers utilize effective communication tools to solidify their relationships with existing tenants and to showcase their properties’ amenities to potential tenants. It’s a cost-effective way to increase tenant satisfaction and, in turn, occupancy rates. A recent study by Kingsley Associates, a leader in real estate research, confirms that tenants who are satisfied with property management are three times more likely to renew their leases. Perhaps to help eliminate that fear or reluctance that building owners and managers might feel, I thought I would point out a few things they can consider doing to attract and retain tenants. Make communication a priority from the start: Emphasize that your property management team values communication with tenants from the very first conversation. I know firsthand that tenants want you to listen, and that we appreciate knowing our concerns are heard and prioritized by building management. Listen: If you don’t know what your tenants want, you can’t give it to them. Set up one-on-one meetings with each tenant at least annually to gather feedback and determine their priorities. You could also distribute a survey to benchmark tenants’ satisfaction and find out where they’re looking for improvements. Create a tenant communication plan: According to that same Kingsley Associates study, communicating proactively with tenants is one of the top ways property managers can increase tenants’ satisfaction. If you haven’t already done so, sit down and consider how often, about what subjects, and in what form you will proactively communicate to tenants. Announce new tenant signings and amenities: Publicize new tenants, green buildouts and new amenities through press releases sent to local media. Market these milestones internally, as well. These show you’re constantly improving and that your building is a desirable leasing location. Host events: Holding events in your property’s lobby or plaza can be a great way to showcase your building, reaching both existing and prospective tenants. 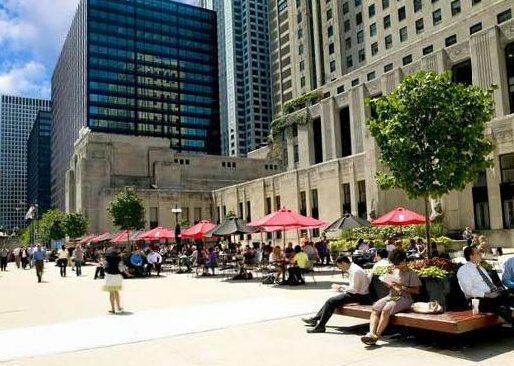 At Two North Riverside Plaza, they host a “Rock the Plaza” concert series on select Thursdays throughout the summer, 330 North Wabash Avenue hosts The John Buck Company’s annual “Spring Fling”and various downtown buildings open their plazas to farmers’ markets. The management of Two North Riverside Plaza hold free "Rock the Plaza" concerts each summer. Consider social networking: Nearly 50 percent of the U.S. population is on Facebook. That means your tenants and their employees subscribe, as well as prospective tenants. Creating a Facebook page for your building can be a great way to connect with current and prospective tenants, and to market your space through photos and testimonials. Some property managers fear social media invites tenants to air complaints, but it can actually be used to improve customer service. Let’s face it, your tenants will talk about your building regardless; wouldn’t you rather see what they’re saying so you can respond to their concerns and requests – and show others that you’ve responded? In the “new normal” that has emerged since the Great Recession, tenants have more control than ever when choosing a building. If I were a building owner or manager, that would be enough to have me start listening – and communicating. This entry was posted in Property Management, Tenant Relations and tagged BOMA/Chicago building members, BOMA/Chicago buildings, building owners and managers, Communication strategies for real estate managers, office tenant retention strategies, property management. Bookmark the permalink.